The annular generator is of primary importance in the gearless system design of our wind turbines. Combined with the rotor hub, it provides an almost frictionless flow of energy. 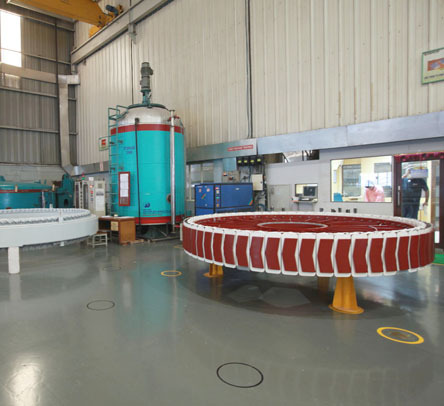 The Generator Production facility at Daman, covers a surface area of 1970 sq. mts., with an annual production capacity of over 1000 MW. Starting RPM - 12 with O/P Frequency 5 Hz. Combined with the rotor hub it provides an almost frictionless flow of energy. Smooth running of fewer moving components guarantees minimal material wear. Minimal mechanical wear, which makes it ideal for particularly heavy demands and a long service life. No direct coupling with grid, proper Isolation provided. Low machine stress due to high level of speed variability. The sensors activation temperature is well below the continuous temperature resistance of the insulating materials used in the ring generator. This means that overloading caused by excessive temperature is prevented. The Stator is a well designed, ring type construction with small axial length and large diameter. The production process is very well designed and conforms to very high quality standards at each stage of manufacturing. The laminated core is coated with varnish (impregnated and powder coated) to provide excellent corrosion protection against environment. The stator has a continuous joint-less single layer winding, especially suitable for low speed generators. The insulation scheme caters to class 180 requirements. HV Testing ensures the health of the insulation scheme of the generator. The Rotor is a separately excited to have minimum stresses and optimum power, multiple salient pole type, suitable for a low speed generator. The Pole shoes are manufactured to the highest quality standards. Wind World (India) Ltd. has a Vacuum Impregnation process under controlled conditions with resin storage facility, equipped with chillers and well equipped Autocycle impregnation plants. The process replaces all air pockets from the windings with insulating resin and ensures good bonding, thus, improving magnetic properties. Wind World (India) Ltd. employs well designed air draft ovens equipped with programmed heating cycle, to provide uniform heating conditions for baking of stator and rotor. The baking process ensures proper coating of resin and additional mechanical strength to the windings. Powder coating of the Generator is a unique and specialised process at Wind World (India) Ltd. After the baking process, each stator and rotor is powder coated separately in hot condition with special Resicoat powder, to give an additional coat of insulation and a better aesthetic look.